Last weekend at Quilt Market, Rachel and I finally got a chance to meet after working together for the past year. And can you believe we forgot to take a photo to commemorate the occasion? It’s always wonderful to catch up with friends at Market, but it was even better to spend time getting to know Rachel and hanging out with my sister, who also lives in the area. Thanks for the fun weekend, everyone! By the way, Rachel posted a whole bunch of photos of Oliver + S samples that she found as she wandered the show floor. It’s always a surprise and a treat to see our patterns show up in so many places! Since I didn’t get a photo with Rachel, I’ll instead share this darling photo from the new issue of Stylo Magazine, which is especially vibrant and colorful with its High Fructose theme. Isn’t this adorable? Hide-and-Seek Tunic and Class Picnic Shorts sewn by Erin Maupin and Carol Chong, featuring fabric designed by Avril Loreti for Cloud 9. If you’d like to see the rest of the issue (and why wouldn’t you?) you can find it right here. You might need to take it in gradually over the weekend; there’s a lot to absorb! 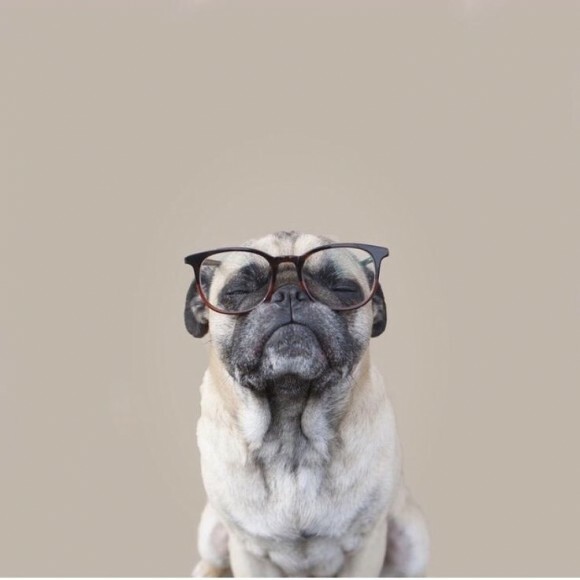 Ready for some Pinterest pick and weekend reading links? Here we go. Don’t know why, but I love this and could stare at it for hours. 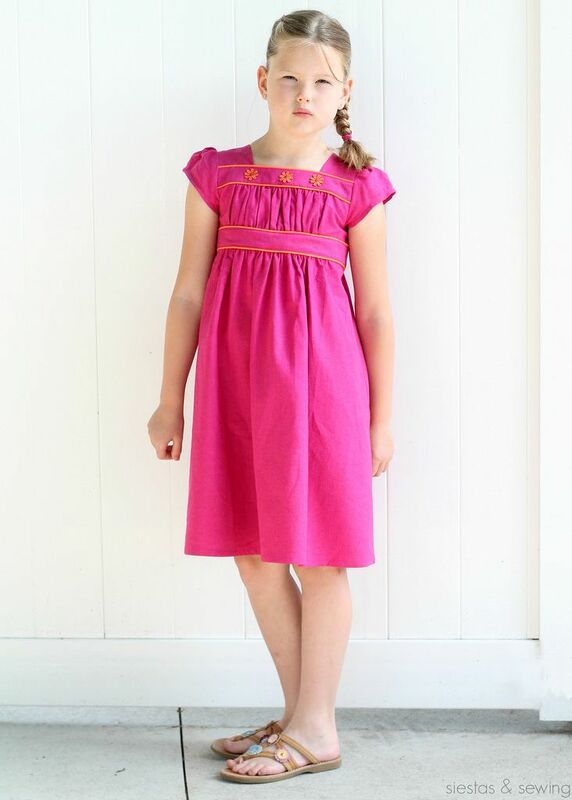 Nicole just finished sewing this candy-colored Garden Party Dress (love the trim!) for Cindy’s daughter. So pretty! If you follow me on Pinterest, you may have noticed that S and I have a new shared folder called Animals for S. Because there’s nothing she loves more than cute animals. Pretty, yes? 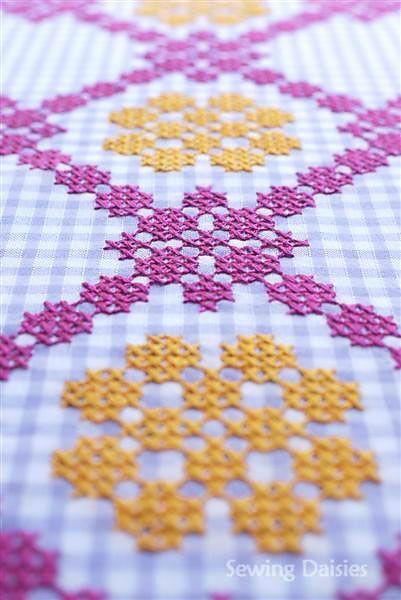 This cross-stitch on gingham would be so much fun to do. The grid is already in place! I’m thinking Hide-and-Seek or Cinema Dress yoke. If you’re afraid that our City Stroll Wrap Skirt is too short for your preferences, here’s a little inspiration for you. 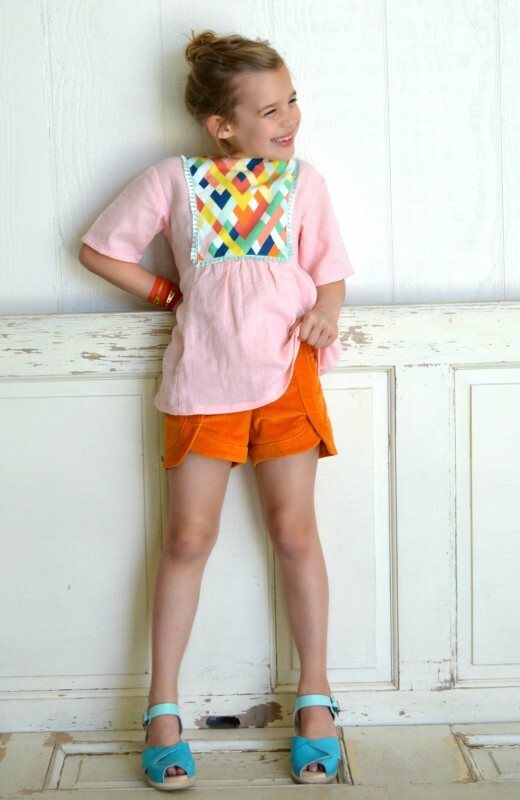 You could use the lengthen lines on the pattern to extend the skirt to the knee or just below the knee, like this. I love the indigo ikat, too, don’t you? B and J fabrics has several options you could use for a similar look. The intersection of art, craft, and female entrepreneurship? Yes, please! Welcome the world of extreme knitting: Little Dandelion. Harris tweed. For those of us who are fabric geeks, this is a great read about the history and the folks behind those beautiful handwoven Scottish woolens. I only just heard about this organization, but several people at Quilt Market mentioned it, so clearly many of you are already familiar with it already. Days for Girls provides sustainable feminine hygiene products so young women don’t have to miss school or work. Such a simple solution that can help to reduce poverty and give these women dignity. You can contribute through your sewing by making kits! Pothole-filling ice cream mosaics. This makes me so happy. With all this talk about our Maritime Knit Top, how about a visit to the Saint James factory? Have a wonderful weekend. And for those of you in the U.S., happy Memorial Day! Days for Girls-genius! Thank you for sharing! That first picture was my very favorite from the Stylo magazine. Thank you for featuring my dress on Cindy’s gorgeous daughter. You should see the swimsuit she made my Matilda, from scratch!